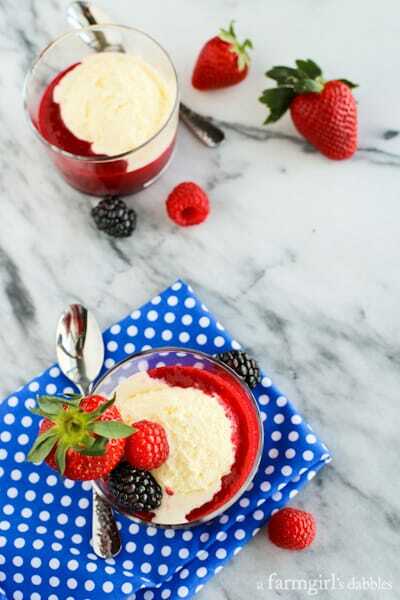 This Crème Fraîche Ice Cream with Triple Berry Sauce is both beautiful and decadent. 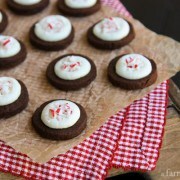 It’s a most wonderful sweet treat! Crème fraîche ice cream? Oh my, yes. I’m pretty sure this is the creamiest, most decadent ice cream I’ve ever sunk a spoon into. 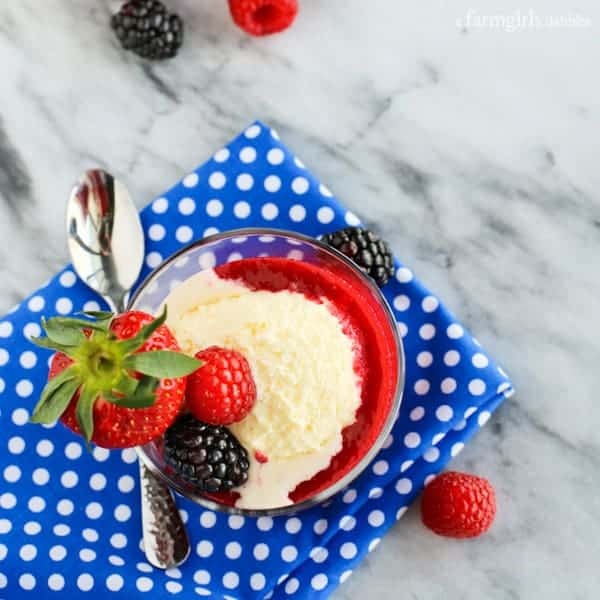 And the gorgeous flavors of the mixed berry sauce work perfectly with it, a bright and contrasting pool of beautiful, vivid berry deliciousness. Make this Crème Fraîche Ice Cream with Triple Berry Sauce. You are going to love it! 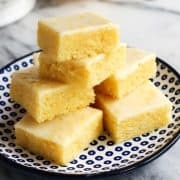 The recipe I’m sharing with you today is the birthday dessert request from our oldest daughter, Hatti. Today she became a teenager. My little girl!!!!! 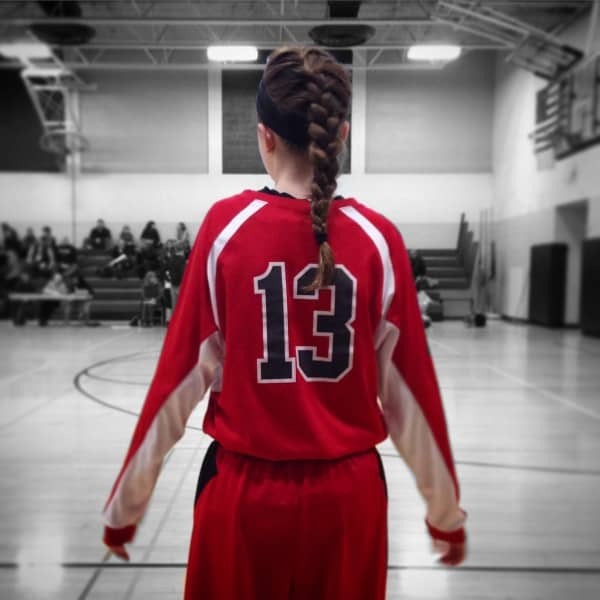 I couldn’t resist sharing this photo I took of her during her latest basketball season. She was playing around with photo apps and turned my pic into an artsy piece, black & white & red. Hatti has been talking about making crème fraîche ice cream ever since our family shared an incredibly memorable meal together at Butcher & the Boar at the end of last summer. Pastry Chef Rachel served us a huge and awesome family-style brûléed banana split AND a gorgeous in-season Michigan blueberry browned butter tart, topped with a big scoop of homemade crème fraîche ice cream. It took Hatti all of one spoonful to fall in love with that ice cream, all dense and creamy and tangy delicious. Our grocery store has been showing off such lovely berries lately, that I couldn’t resist making a fresh triple berry sauce to accompany the crème fraîche ice cream. Its vivid color is a gorgeous contrast to the cream-hued ice cream, making this dessert simply pretty to look at. And the berry sauce’s zingy, fruity flavor adds just the right touch to balance the extreme creaminess of the ice cream. These two recipes were meant to live in the same bowl. Hatti is savoring every single spoonful of this birthday treat, grateful to Pastry Chef Rachel for sharing her crème fraîche ice cream recipe with us. There will definitely be more churning of this wonderful ice cream in our future. It will be the perfect warm summer’s evening treat out on the deck with friends, swimming in a pool of fresh raspberries-just-picked-from-our-garden sauce. I can already taste how glorious it will be! Prepare an ice bath in a very large bowl, adding cold water and plenty of ice, until bowl is about half to two-thirds full. Set aside. In a medium-large saucepan over medium-high heat, bring milk and cream to a gentle boil, stirring almost constantly, and then immediately remove saucepan from heat. In a medium bowl, whisk egg yolks and sugar together until very well incorporated. Then slowly pour about 1/3 of the hot milk and cream mixture into the egg yolks, whisking constantly. This tempering of the yolks will ensure that they do not “scramble”. Then whisk the heated yolk mixture back into the saucepan with the remaining hot milk and cream. Return saucepan to medium-low heat and gently cook, constantly stirring and scraping the bottom of the pan, until mixture is thick enough to coat the back of a wooden spoon (about 170° on an instant-read thermometer). This will take 20 to 30 minutes. Float the saucepan in the prepared ice bath, holding onto the handle and taking care to not let the saucepan sink too far into the water so that water gets into the saucepan. Stir constantly until mixture is completely chilled. 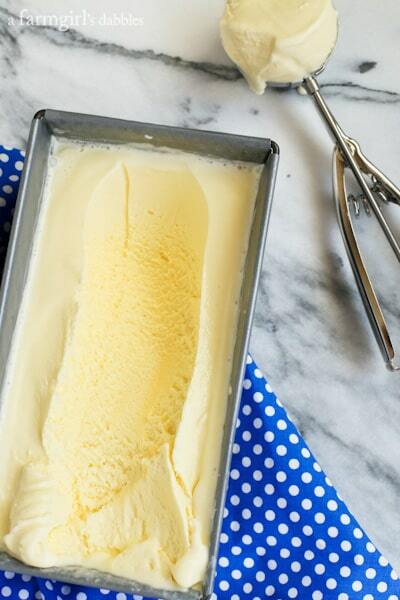 Pour ice cream base into a bowl, cover it, and then chill for 4 hours or overnight. When ready to churn, pour chilled ice cream base through a fine mesh strainer into a large bowl. Whisk the crème fraîche, corn syrup, and salt into the ice cream base until it is completely smooth. Freeze in an ice cream machine according to manufacturer’s instructions, until ice cream is light and fluffy. I have a smaller ice cream machine, so needed to freeze the ice cream base in two separate batches. Place finished ice cream in the freezer for about 4 hours to firm up before serving. Place all berries in a blender or food processor, and purée. Place a fine mesh strainer over a bowl and line the strainer with a double layer of cheese cloth. Pour half the berry mixture through the cheesecloth. To get the maximum amount of juice out of the berries, gather up the cheesecloth and press on the berries with the back of a large wooden spoon, until all that’s left is seeds in the cheesecloth. Discard cheesecloth. Add remaining pureed berries to the strained berry juice. Stir in sugar and lemon juice. Pour into a medium saucepan and place over medium to medium-high heat. Bring to a gentle boil. Reduce heat to medium and cook for about 5 minutes, stirring frequently. Reduce heat to low and continue cooking for 8 to 10 minutes more, stirring regularly. When the sauce is done, it should be reduced by about half, with a vivid berry color. Cool to room temperature. Store in refrigerator and use within a few days. Crème fraîche ice cream recipe adapted from Butcher & The Boar, reprinted with permission from Executive Chef Peter Botcher and Pastry Chef Rachel Slivicki. 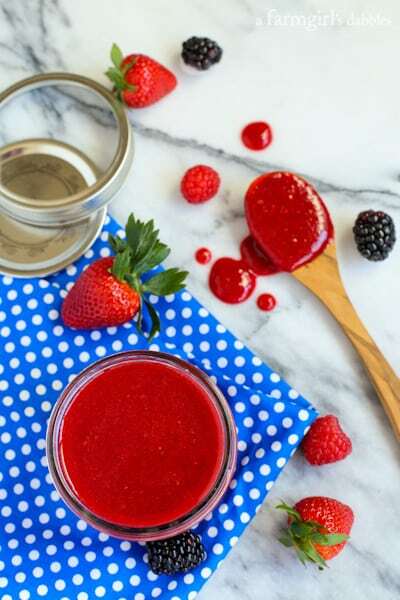 Triple berry sauce from a farmgirl’s dabbles. Happy B-day to Hatti! My daughter will be a teenager at the end of this year! I’m dying to try this beautiful ice cream recipe! This sounds like an ice cream I could fall in love with too. She did a great job with the picture. My how they grow up. Happy birthday !!! Lovely dessert, thanks for sharing !! What a bright and pretty dessert! Enjoy! Happy first day of spring to you too! I can’t even imagine having a teenager. I think I’ll probably cry. 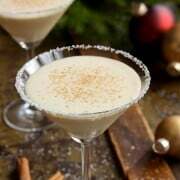 :) But this looks soooo good!! What a perfect request!